I’ve been cleaning up the toxins in my body and life. It actually hasn’t been that hard. 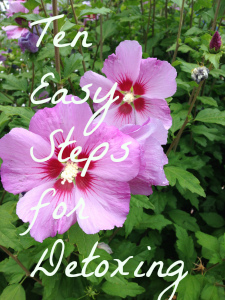 Here are ten ways you can too! 2. Use the Environmental Working Group’s list of the “Dirty Dozen” and “Clean 15” to make sure you are buying organic fruits and veggies when you need to. I actually printed out a wallet card and carry it with me since my memory is not the greatest. You can print out a wallet card here: dirty dozen card or here’s an updated one for 2014: dirty dozen 2014. 3. Use only homemade cleaning products. I clean almost everything with some combo of baking soda, lemon, and white vinegar. You can look online for specific recipes. Cleaning like this should also help you not need toxic air fresheners since baking soda, vinegar, and lemon naturally deodorize. 4. Don’t use food canned in BPA laden cans, which is most cans. Sometimes there are companies that use cans without BPA, such as Natural Value or Muir Glen. Pomi Tomatoes in the box are a BPA-free alternative to canned tomatoes. A little research goes a long way, so read your labels and look stuff up on the internet! 5. Eat organic, grass-fed meat whenever possible. 6. Use organic dairy products whenever possible. 7. Sweat. Either through exercise, or using a sauna. One of the main ways our body gets rid of toxins is through our skin. 8. Drink plenty of water. Divide your weight in half. Drink that number of ounces per day (I weigh 150 lbs, so I drink 75 ounces). Use a reusable glass water bottle. 9. Don’t heat your food in plastic—those frozen entrees that you put in the microwave? Not good. Storing leftovers in plastic containers and heating in the microwave? Nope. Using a plastic splash guard over your food in the microwave? No. 10. Relax. Stress is so toxic. Breathe; look at the sky; pet the cat; smile. This entry was posted in health, mental and emotional well being and tagged care of the self, detox, ease, fibromyalgia, health, healthy, housekeeping, pesticides, relaxation by Project Easier. Bookmark the permalink. Great article! It is so helpful to make cutting out the poison easy — easier than just buying that product because it’s there, because it smells good, etc.